Aside from drowning, another serious accident that can happen in a swimming pool is diving. Although the common outcome of diving accidents are head, neck and back injuries, there are cases of diving accidents where the victim go unconscious, submerge in the water and drown. Almost half of these injuries take place during a swimming pool party where alcohol or sometimes drugs are involved. 58% of injuries are cuts and bruises mostly from hitting the diving board or platform and even the professionals can fall victims. Blame it on the diving board? The tempting look of the diving board makes it easy for some people to point the finger at it as the cause of a diving accident.This is a common misconception. Spinal Cord Injury Information Network and the University of Alabama at Birmingham concluded that less than 10% of all swimming pool diving injuries involve a diving board. As long as the diving board is properly installed on the proper pool area, well maintained and supervised, there's a lower risk of diving accidents. A diving board can even "tell" the swimmers of the deep part of the pool where it is safe to dive and prevent swimmers from making contact with the pool's edge that can cause injury. It also warns the children about the possible danger of the pool's deep-end part. 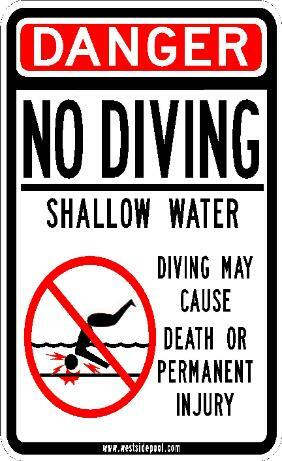 Studies shows that in 10 diving accidents 8 of them happened in a swimming pool that has no warning signs. However, swimmers, mostly males, would ignore such warning signs especially if other swimmers are diving into the pool. This is where social factors come into play. Supervision is the best way to prevent diving accidents the fact that 9 of 10 cases don't have a lifeguard on duty. For pool owners, it is very important to clearly mark the depth of the pool and install the diving board at the correct place; for 1 meter springboard it is recommended to place it at 11 feet pool depth and for 3 meters board, 13 feet depth is the minimum. Proper pool lighting should not be compromised especially during pool parties. For pool users, be familiar with the pool first before diving. A poorly lit pool has greater risk of diving accidents. Don't drink and dive and comply with the warning or the lifeguard's whistle blast. My Homework is done! Thank you! Greetings from Chile. I like this site. Its nice and it gave us lots of ideas. Thanks for sharing. Safety is the foremost thing what you should be aware while you are in swimming pool. And if your kids are around then you must . But for all keep all the rules and regulation in your mind and then enjoy swimming. I hit the back of My Head on a diving board years ago, but I still get bad headaches. I am never jumping off a diving board again. Thank you for your comment. As a person that has been in the aquatics field for 15 since I've been 15. Parents are sometimes so blind and don't want to follow or listen to rules because they're too busy - reading, drinking their "tea" in their covered tumbler or conversing so much and hat they are not paying attention to the kids that are diving. As a rule of thumb: "face forward feet first" is what I tell all the kids when my staff comes in duty as some residents are already there and do no follow any rules. When a serious accident occurs there will be somebody the parent is going to blame but that will not be me or my company. An important topic to discuss. I liked the clear division of information. Additionally, I liked the use of cited infomation. Diving accidents happened daily because there the lack of training of the people. Compass Claims is an insurance provider company with quality services and affordable prices. When a serious accident occurs there will be somebody the parent is going to blame but that will not be me or my company.